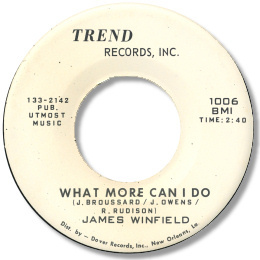 Another in the apparently endless list of New Orleans singers, who recorded only one session, James Winfield had a pleasant if unexceptional baritone voice. This obscure disc What More Can I Do, like others on the label (see Earl Daniels) benefits from a big horn section beautifully arranged and that irrepressible Crescent City rhythmic feel. It’s a cliché to say it, but the city really did have the richest musical heritage in the US and although the jazz and R & B scenes are rightly celebrated, the soul recordings of the 60s have yet to be acknowledged properly. In part that’s due to the myriad tiny local labels, a lack of decent distribution outside the state, and to the collapse in 1968 of the Dover concern which handled much of the city’s black music output. This last factor – and the impounding of the stock of 45s which the company had – has meant that New Orleans 45s remain amongst the hardest of all to find. UPDATE ~ Tom de Johg writes with details of a new CD on the Southland label by a James Winfield entitled "Lonely Lonely Nights". A very interesting and informative interview and biography of James - including more details of this 45 and his CD can be found here. Thanks to Tom de Jong for an excellent piece of research.